Compared to traditional methods of tooth replacement, dental implants offer a wealth of benefits. This is especially true in the case of significant tooth loss, when the alternative treatment option would be a partial or complete denture. Keep reading to learn more about the differences between dental implants and dentures in Chaska, and which one may be best for your smile. Our team is here to help you choose the very best option. Whether they are partial or complete, traditional dentures rest on the gums, and will often slip or slide around at the most inconvenient times. Patients who wear a traditional denture may struggle to find an appropriate fit, and often suffer with a limited diet, difficulty speaking, or bothersome oral sores or blisters. Fortunately, dental implants can be used to retain a partial or complete denture to provide unmatched security. Rather than resting solely on the gums, the denture is affixed to the top of implant posts which are anchored firmly in the jaw bone. You will not need an individual implant post for every missing tooth -- rather, the denture can be secured on a strategic number of implants. The number of implant posts that you require depends on how many teeth you have lost, and where in the jaw the denture will be placed. 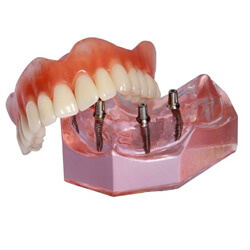 Sometimes, a complete denture can be secured on as few as four dental implant posts. For traditional dental implants, the implant posts will be placed and allowed to heal over the course of several months. A temporary prosthetic may be worn during this time to ensure you don’t have to spend any extra time with missing teeth. Once the posts have healed together with the jaw, the denture can be affixed on top. Many patients who are missing or on the brink of losing a significant number of teeth can benefit from dental implants. If you have been missing teeth for a while, you may need to have a bone graft performed first to improve the environment for dental implants. We can tell you whether or not you are a likely candidate during a consultation! If you are, you can look forward to getting started right away. To find out more about implant dentures or to schedule a consultation to discuss how you can get started with dental implants, please don’t hesitate to contact Chaska Dental Center. 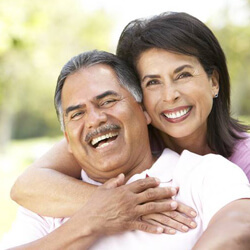 We can’t wait to help you enjoy all the benefits of a sturdy, long-lasting tooth replacement!